Kristina truly believes that by optimizing one’s mind, body, and spirit, one's quality of life can be optimized. Her clinical practice largely focuses on setting the foundations for health through diet, lifestyle, and mindset interventions. Once the foundations of health are in place, then indicated herbs, nutritional supplements, and/or acupuncture are utilized. Kristina prides herself in her strong research background, and through Naturopathic medical practices, she offers a complementary approach in conjunction with treatment from your family doctor and other allied health care providers. Optimal health rarely packages itself nicely into a box, and sometimes one approach to health cannot always provide all of the answers. Kristina views her role as a Naturopathic Doctor is to support YOU, the individual, on the absolute best healthcare options-whether it be naturopathic medicine, a referral to conventional medicine, or the perfect blend of both. Kristina grew up mucking stalls in hand-me-down rubber boots on her family’s swine and cash crop farm. An animal lover at heart, she could often be found in the farrowing wing of the barn or out riding horses. Family life always had a focus on eating and growing whole, nutritious foods. 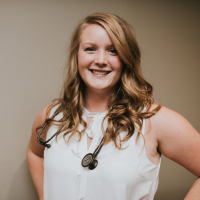 She is proud of her ties to the agriculture community and aims to bridge the gap between modern day agriculture and modern day Naturopathic Medicine. These days, you can usually find Kristina outside with her faithful dog/sidekick, Riley. In her downtime, Kristina loves to read, travel, garden, and bring new life into old homes and furniture. In the summer months, you can find Kristina as a vendor at the Woodstock Farmers Market, selling her own farm fresh vegetables. She is an active Big Sister with Big Brothers, Big Sisters of Ingersoll and Tillsonburg. She is humbly grateful for the opportunity to serve Ingersoll and surrounding communities as their Naturopathic Doctor. Kristina holds an Honours Bachelor of Science from the University of Guelph, and a Doctor Of Naturopathic Medicine from the Canadian College of Naturopathic Medicine. During her studies at the University of Guelph, she conducted research with the departments of Population Medicine, Biomedical Science, and Animal Health and Nutrition. During her studies at the Canadian College of Naturopathic Medicine, she was selected to be a naturopathic clinical intern on the highly competitive Fertility and Reproduction shift, as well as at the integrative Naturopathic Teaching Clinic within the Brampton Civic Hospital. Additional certifications include facial and cosmetic acupuncture. In addition to infertility, Kristina has special interests in chronic pain and gut health optimization. Dr. Kristina Dekroon, HBsc, ND, is registered and in good standing with the College of Naturopaths of Ontario, the Canadian Association of Naturopathic Doctors, and the Ontario Association of Naturopathic Doctors.